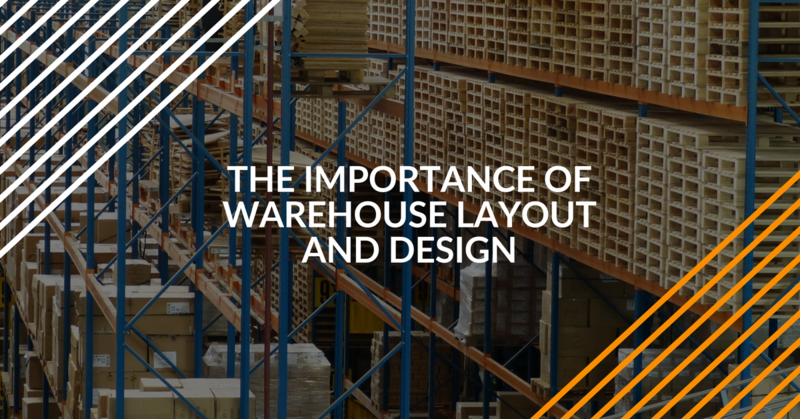 Whether you plan to reorganize your existing warehouse, build a new facility or move to another building, give some thought to the warehouse’s design and layout. Careful planning will allow you to make the most of the floor space that’s available. Types of Goods to be Stored. It’s important to take into account every stock keeping unit (SKU) the warehouse will hold. Considerations include each item’s dimensions, weight, and packaging. Also, consider the minimum and maximum quantities of SKUs on hand at any given time. This will help determine the amount of floor space required, as well as the type, size, and number of storage racks and shelves that will be needed. Make note of any items are temperature or humidity sensitive. Physical Characteristics. The length and width of the building’s floor area needs to be precisely measured to plan a warehouse layout. You’ll also need to know the clear ceiling height. Other factors include the location and dimensions of fixed obstacles, such as support columns, mezzanines, restrooms and interior offices. Take into account the source and amount of electrical power, along with the sizes and locations of all windows and doors. Machinery and Equipment. There needs to be enough room for forklifts, jacks and similar equipment to move around safely. The size and location of all machinery and equipment used for production, assembly, packaging and other activities needs to also be known for warehouse planning. Inventory Flow. Moving materials and inventory cost money. It must be kept to a minimum. For the most efficient warehouse layout, take into account inventory flow. This includes activities like receipt of parts and materials, moving finished goods to and from storage, processing orders, retrieving items and shipping them out. This analysis should also include how often the inventory is turned over. Number of Employees. Determine the maximum number of employees on site at any given time. Consider how they are organized and the number of shifts the warehouse will operate. These will affect safety issues, such as the number and location of emergency fire exits. The number of workers will also determine how many restrooms are needed to comply with OSHA regulations. Create a Schematic Layout. Regardless of the warehouse size, start by putting a basic plan down on paper or on a computer screen. It can be downloaded and printed when you’re finished planning. It’s best to use a copy of the building’s blueprint if there’s one available. If not, lay the space out on grid paper, using a scale of one grid square equaling one square foot. Be sure your measurements are accurate. Measure the building yourself. Accuracy is very important, so it’s best to use a laser measuring device. Even errors of just a few inches here and there can cause problems when you install workstations and shelving. Make a note of any supports, built-out areas, overhead doors and other items you’ll need to plan around. Equipment and the Space Around It. Identify the key areas that will take up the most space in your operation. For E-commerce businesses that mostly store and ship products, key areas will probably be racks and shelving. For manufacturing and assembly operations, key areas might include machinery, equipment, and workstations. Whatever your key areas are, make them the first things to put on your plan and design around them. Production Areas and Workflow. The next thing to consider is a smooth workflow. Give thought to how people, materials, and products can most safely and efficiently move around in your key areas. For manufacturing operations, be sure to make space for workbenches, tools, bins and similar items. Be sure there’s enough room in the production zone for workers to produce to safely move supplies in and finished goods out. For businesses that stock and ship products, the aisles between shelving are primary work areas. There needs to be enough room for employees to maneuver equipment to stock shelves and pick items when filling orders. Other primary work areas are the production zones where packaging, shipping, and receiving take place. Assembly operations sometimes combine the requirements of manufacturing and stock and ship businesses. You’ll need to reserve space for workers and their tools, benches, and assembly equipment. You’ll also need space to package and ship the goods. Storage Areas. A well thought-out storage area is a key element in warehouse design. The type of storage you need depends upon the size, weight, and quantity of the items you’ll store. It also determines the space needed in and around storage areas, including the aisle widths between rows of shelves. Depending upon the clear height in the warehouse, store items on taller shelving to save valuable floor space for other uses. Pallet Racks. Used for storing pallets with medium to heavy loads of stock and finished goods. Pallet racks are typically 3’ to 4’ deep x 8’ to 20’ in height. They’re probably the most cost-effective type of shelving for large storage areas. Heavy Duty Shelving. Used to store light to medium weight loads, like bins filled with small parts. Typically 3’ or 4’ deep, 6’ to 8’ in length and 6’ to 8’ high. Light Duty Shelving. Also used for storing small, lightweight items, such as parts. Usually 18” to 2’ deep x 4’ long x 6’ to 7’ high. Cantilever Racks. These hold large items like pipe, paneling or lumber. Check with a local supplier for information on the various sizes and load limits. Hoppers, Bins, and Barrels. Used for storing various parts and materials in manufacturing and assembly operations. They’re typically loaded on pallets and moved with pallet jacks. Small Parts Bins. Used to hold large amounts of small items where space is limited. Bins are either stacked on shelves or on workstation tables. Utility Tables and Workbenches. Used in manufacturing and assembly activities. Common sizes are 2’ to 3’ deep by 5’ to 8’ long. Packing Stations. Typically 3’ deep x 6’ long, these are used to prepare goods for shipment. Pallet Freight Scale Station. Used to weigh outgoing shipments. Typically 4’ x 4’ or 4’ deep x 6’ long. Stock Carts and Pallet Jacks. Used to move materials and goods within the warehouse. They’re normally 3’ or 4’ wide x 5’ to 8’ long. Where do workers spend most of their time? Where does most work take place – storage areas, workstations or areas with manufacturing equipment? What items do workers need to move or gather, or have nearby? Aisles between shelving should feed directly to the busiest production areas. They need to be wide enough for workers and equipment to move freely. Packing and Shipping areas need to be roomy enough for workers, equipment and packing materials. Be sure to allow space to load pallets for larger orders. Shipping and Receiving Areas need to be located near docks and overhead doors to efficiently receive materials and ship out finished goods. Be sure to leave enough room to unpack materials as they’re received. Equipment Storage Areas need to have enough room to keep forklifts, pallet jacks, rolling ladders and similar items out of the way when they’re not in use. If there isn’t a place to store equipment, traffic flow will be disrupted and productivity will be affected. The final step is to test your layout. Use masking tape to mark off the locations of workstations and workbenches, manufacturing and assembly, storage and shelving and other areas. Walk the space just as if you were working . This will allow you to make final adjustments to your plan before moving in shelving, equipment and workers. Warehouse planning and design doesn’t need to be difficult if you follow the guidelines in this article. Without a well thought out design, however, your operation could very well pay the price in terms of time, money and lost productivity. In today’s booming economy, a lot of businesses are finding they lack the space to house enough inventory to meet customers’ demands. With space at a premium, it’s important that you make the most of the space you have. This may mean totally reorganizing your warehouse storage area. Shelving may need to be rearranged or aisle widths adjusted to maximize space and increase efficiency. For more ideas on how to improve flow and productivity by adjusting aisle widths, read the post here. Online shopping and E-commerce have caused an increase in demand for warehouse space. They’re also affecting the way warehouses are operated. Operating hours are longer, and more workers are being hired. Businesses are also buying more equipment, including forklifts. There’s also an increased demand for trained and certified forklift operators. To find out more about how E-Commerce and online shopping are affecting warehousing, click here. You’ll also learn more about new job opportunities for warehouse workers and certified forklift operators.